It is horrendously difficult to maintain the level of success Sebastian Vettel and Red Bull have achieved in the last four years, and which has led to Vettel winning more consecutive races in a single season than anyone in history. One of their key secrets is to take one race at a time. It's the most hackneyed of sporting clichés but it's exactly the right approach and Red Bull do it exceptionally well. It ensures that a long, arduous championship does not burn the team out. If you can attack each race at a time and either win it or do the best you can, then the points at the end of the season add up and you win the title - if the car is good enough. What has maintained them is that each race is worth winning, a stand-alone event in itself. Vettel seems to come back stronger each season, and better prepared mentally. That probably comes from confidence from the wins he's getting, which make him more relaxed. It's a virtuous circle. He never seems to have the bad spells that so many drivers suffer from. He always maintains his hunger and aggression. Admittedly, that's easier when you have consistently the best car, rather than if you're struggling against the odds. 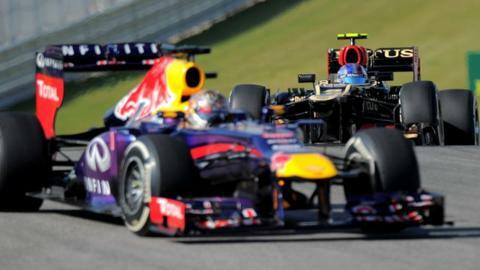 But Vettel can only do the best he can in the equipment he has, and you have to compare him with his team-mate. Mark Webber is a quick driver and he has scored less than half the points Vettel has this year, and in four years he has been close to the championship once, when he came a close third behind Vettel and Fernando Alonso in 2010. He knows this success can't last forever and that things will go downhill sooner or later so he is right to say they should enjoy it while they can. Fernando Alonso secured second place in the world championship in Austin on Sunday and he will probably say he has won the non-Red Bull championship. That's a good way of putting it. Alonso digs very deep on a Sunday afternoon. I think he backed out of it a little for a couple of races when he knew the championship had gone. Some of the aggression we normally see from him had gone. But in America he was right on it. His qualifying lap to take sixth on the grid in that Ferrari was phenomenal. He was three or four places further up than the car deserved to be. And in the race he did the best he could to take fifth. That was not an easy result to get. Sauber have improved and are probably now faster than Ferrari, and McLaren were also in decent shape in Austin, or at least Sergio Perez was. Alonso had to pass both Sauber's Nico Hulkenberg and Perez to get that result. It's an exceptional achievement for Alonso to finish so high up in the championship - let's not forget the second driver in the Red Bull, which is clearly a faster car, is 46 points behind him. Alonso has finished second to Vettel in the championship in three of the last four years and Ferrari are yet to give him a car he deserves in any of them. They have to do that - as do Mercedes for Lewis Hamilton - so we can see a real battle on an equal footing between Vettel, Hamilton and Alonso next year. I doubt it will be like that, but it would be lovely to see, because those three guys are the class of the field. I sensed a bit of frustration in Hamilton's radio messages on Sunday. That's not really on. The guys are only giving him the information he needs and he'd have had a few words back if that had been me on the pit wall. At the end of the day a driver has to work closely with his engineer. You are bosom buddies. That's what makes it work and that's what Vettel has with Guillaume Rocquelin - or Rocky, as everyone calls him. Lewis needs to buy into that, too. Austin provided Valtteri Bottas a chance to show off the potential many have seen in him for a while. He qualified ninth, which was a great result even if he should have been seventh given the pace he had shown in the second part of the session, and he finished the race eighth. On top of that, he got the third fastest lap of the race - and it was not a late-stop, fresh-tyre special, because it was not that kind of race. This was possible because Williams have made big steps forward by removing their 'Coanda' exhaust - the technology all the leading teams have which uses the exhaust gases for aerodynamic effect. Williams finally realised that they did not understand the Coanda and that it was hurting the car more than helping it. Any aerodynamic aspect of an F1 car has to behave consistently, and theirs was giving unpredictable handling. That destroys the drivers' confidence and makes the car worse. Having the Coanda exhaust definitely hurts the fundamental airflow at the rear of the car compared to a more conventional bodywork arrangement. If the Coanda works, that doesn't matter because the benefits outweigh the losses, but if it doesn't then you end up with a net deficit. By taking it off, Williams have made the rear aerodynamics work better, which gives more rear downforce, more consistency and the driver can use the car more effectively. Pirelli took the same designation tyres to the US Grand Prix this year as they did last year - the medium and the hard. Both tyres were very durable - the medium could almost get to half distance and the hard tyre did about the same in terms of wear. Some people might not like one-stop races but everything worked well. The tyres behaved as they should, there were no dramas, no ridiculously short stints, no 'graining', no failures. Drivers demanded tyre safety assurances ahead of the Belgian Grand Prix in August, with Pirelli motorsport director Paul Hembery having said tyre failures were "a worry for the sport"
Ferrari driver Fernando Alonso criticised Pirelli tyres after qualifying for the Korean Grand Prix, saying they were "not normal"
Because the tyres were so durable, some people over the weekend suggested Pirelli could have taken the 'soft' tyre to Austin. But I think that's not correct. I suspect the fast swerves at the start of the lap would have killed it. That would have created similar problems to those we had in India, when Vettel did only two laps on the 'soft' before changing to the harder 'medium'. It emphasises a fundamental issue with Pirelli's tyre compounding this year - the 'soft' tyre is too soft. There is too big a gap between it and the medium. There are four tyres available throughout the season, with two brought to each race. The steps between them should be similar. Going into next year, there will be more races like Austin - one-stop strategies on more durable tyres. Pirelli will have to go that way because of the more extreme demands of the new turbo engines that are being introduced next season. But Pirelli need to ensure the spacings between the four compounds are more even than they are at the moment.